We’ve used this product on several projects and it never disappoints. ModularArts offers 3D panels and wall blocks that really elevates an inteiror to the next level. Wash it with some LED RGB lighting for a stunning effect. These padded, faux leather tiles from NappaTile bring a sense of luxury and artistic presence to a space. They have several lines of specially crafted shapes and textures, making the design possibilities endless. This product has been around for quite a while, but we love the versatility of it. FilzFelt not only transforms a boring wall into a work of art, but offers great acoustic absorbing properties – a perfect solution for conference rooms or open office collaboration spaces. Though it’s shown as a floor application, how stunning would these Jamie Beckwith wood tiles be on a feature wall?! The 3 tone wood combination is on point! 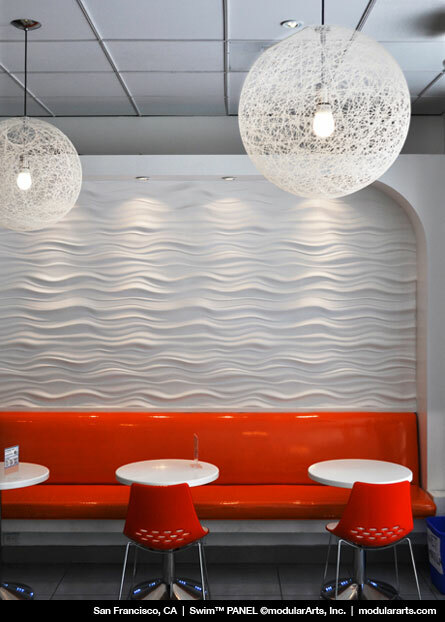 Available in both acoustical and tackable substrates, Carnegie's Xorel Artform panels come in 16 different shapes and a variety of fabrics, allowing you to mix and match to create custom look for any space. This tile system is designed with high performance in mind, offering an acoustical solution with an artful presence.